You don't have to travel around East Anglia for long to notice that it wasn't unusual for communities here to rebuild their churches in the fashionable perpendicular style, bankrolled by late medieval prosperity. Within ten miles of Walberswick you can visit Blythburgh, Lowestoft St Margaret, Covehithe, and most famously Southwold. The same rebuilding happened here at Walberswick - or, not quite. In those other parishes, the new church was erected on the site of the old one, and often incorporated bits of its former fabric. 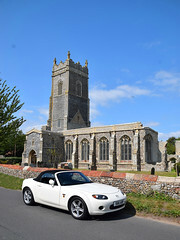 But here in Walberswick, the new church replaced an old one that was more than a mile away. It is easy to imagine that Suffolk's battle with the sea consists entirely of fighting it back as it nibbles at the land. Actually, it's a bit more complicated than that. Dramatic as this destruction has been at Dunwich, Pakefield and Easton Bavents, a more subtle tactic of the sea has been to suddenly alter the coastline, perhaps in a storm. The effects of this could be disastrous, not so much in terms of loss of life, but that communities would have to come to terms with changes which would affect their livelihood. Dunwich was a prosperous seaport, and the third largest town in East Anglia, until the night of 14th January 1328, when a storm threw a shingle bank across the harbour mouth, ruining the shipping and fishing industries. Instead, prosperity passed up the coast, to the village at the mouth of the new inlet. This was Walberswick. 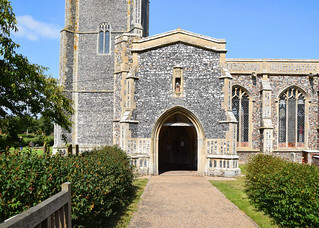 Walberswick's original parish church already existed by the time of the 1328 storm. Indeed, a church was here at Domesday, 1086. We have a good idea of what it looked like towards the end of the medieval period, because the 15th century parish minutes have survived. We know that it was a thatched church, but that it probably had a tower because there were bells. It had stained glass windows telling the story of the martyrdom of saints. 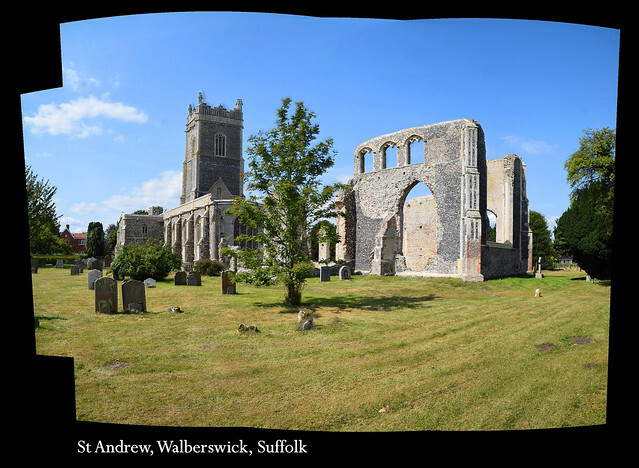 Walberswick grew, and this was probably reflected in bequests to the church. But the sea continued to extend its shingle bank, and gradually the village moved northwards, towards the mouth of the River Blyth, the flow of which prevented the bank from blocking any further. 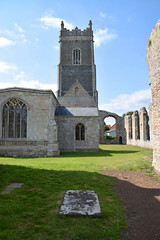 In common with other prosperous communities of the time, 15th century piety encouraged the parish to rebuild their church in the new Perpendicular style. This was done on a grand scale. But the decision was taken to build the new church further inland, near to the heart of the new settlement. It was to be dedicated to St Andrew. 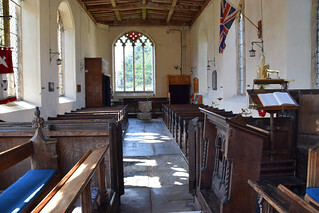 It is likely that the old church rapidly fell out of use, because we know that the bells, windows and images were transferred to the new church. However, the font wasn't, a new one being made for St Andrew. 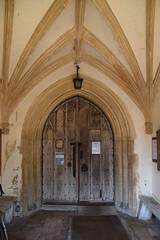 Perhaps the old one wasn't considered fine enough, or perhaps it actually remained in use for a while at the old church. In 1492, the year Columbus first landed on the shores of the Americas, the new church built to replace the old was completed. It was a grand affair, much on a scale with the churches at Blythburgh and Southwold. Intriguingly, the tower of the new church is seventy years older. Perhaps there was a chapel of ease to the old church on this site, and the tower had been built to enhance it, or simply the new church was that long in the planning. Whatever, by the end of the 15th century one of the grandest parish churches in England stood here. 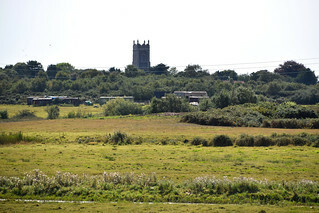 If you come here today, it may be because you are one of the Londoners discovering Walberswick, finding the charms that recently got it mentioned in a Sunday Colour Supplement as one of England's most fashionable watering holes, still cheaper and quieter than crowded Southwold across the river. Or perhaps you are a Suffolker, and come because Walberswick is the world capital of crabbing. 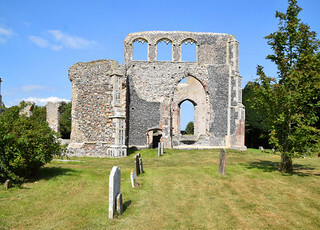 Whatever, the road into the village takes you past this church, and it must entrance you, it cannot fail to do so, for today, St Andrew at Walberswick is one of Suffolk's most dramatic ruins. 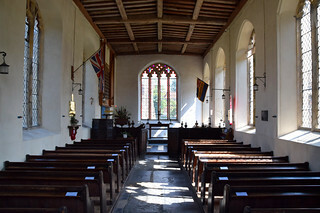 You approach from the south east, and the grand tower conceals the fact that the walls of the nave and chancel are a curtain, surrounding an open space. Within this is a smaller church, of little architectural interest, but of considerable social and historical significance. But to the ruins first. 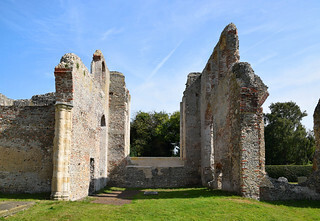 The ruins suggest a building so like the churches at Blythburgh and Southwold that, if we are familiar with those two churches, we can read the missing pieces in this one. The aisles continue almost to the eastern wall of the chancel. Altar piscinas give us a sense of the liturgical life of this place. 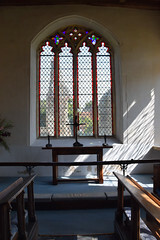 The grand arrays of windows in the south and north aisles allow us to imagine it like Blythburgh, full of light. Those from the north aisle were taken out and placed in the north wall of the new, smaller church that huddles in the ruins. All the coloured glass has gone, destroyed by Puritans in April 1644. They were probably also responsible for removing the brasses that once sat in the indents in the aisle, although their loss may equally be the responsibility of 18th and 19th century collectors. There were Priest doors on both sides of the chancel; on your journey through the ruins, you walk in through one, and out through the other. There's another in the south side of the sanctuary. What happened here? Within 50 years of this great Catholic church being erected in the 1490s, the Catholic church was driven from this land by the state centrist forces of Henry VIII and his children. Instead of living the colourful, sacramental life for which the building was erected, the parishioners became listeners, subject to the congregational, Anglican worship of the new Church of England. And, simply, there were not enough of them to sustain such a large building. 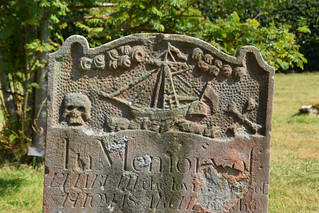 The puritan 17th century's suspicion of maintaining church buildings in their former glory only exacerbated the problem, and by the 1690s the parishioners asked permission to demolish the old church, and build a much smaller one in the ruins. 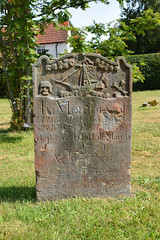 Permission was granted, and this was done, with the proviso that the tower be retained as a landmark for ships at sea. The same thing happened just up the coast at Covehithe. The bells were sold off to fund the work. As you wander among the ruins, you will find a plaque on the north side commemorating the churchwardens who ordered the destruction, and oversaw the building of the new church, Edward Collins & John Taylor churchwardens in the yeare when the church was rebuilt and in the eight year of the reign of our sovereign Lord King William the Third AD 1696. Enthusiastic Protestants, then, and perhaps we should not despair of them. 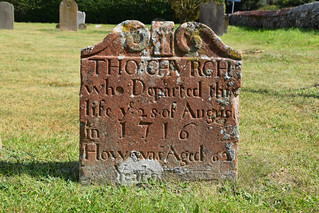 After all, any Parish church is a document of the buffeting winds of history that have swept over Suffolk in the last thousand years. At worst, they were pragmatists, preparing a space that was fitting for the worship of the times. The new church was built in the west end of the south aisle - the old structure completely dwarfs it, and if you stand at the west end of the old nave you are outside, gazing up at the impossibly high roofline with its sanctus bell window. If you step into Collins and Taylor's little church, you find yourself in a space that somehow feels older than the considerable 19th century restorations in the villages round about. 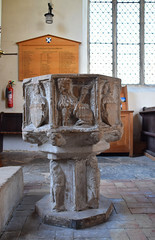 The grand font will catch your eye, surviving as it does from the 15th century building. 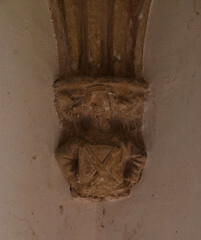 Intriguingly, it is set beside the remains of one of the pillars that divided the nave from the south aisle. The church is full of moving little details, the memorials to fishermen lost at sea, the collection of medieval coloured glass rescued from the ruins and put together as a mosaic in the south aisle. 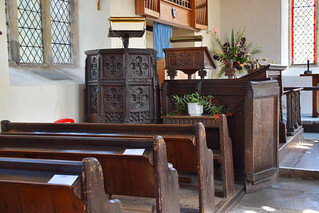 The pulpit and the screen survive from the 15th century church, although the screen is only a remnant, of course. 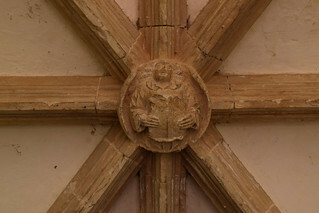 The pulpit sits on another pillar fragment. An unusual survival is the supermensa, set in the top of the altar, a consecrated stone slab used in medieval times by travelling priests. 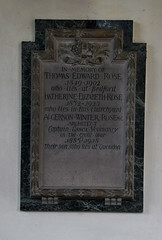 It was recovered from the ruins shortly before the Second World War. A simple, twisted driftwood cross stands on top of it. The ruins here are haunting, not because they are ancient - they aren't. Rather, they give us a brief window into what happened in England between their construction in the 1490s, and their destruction 200 years later. They are a document of the English Reformation, and its uneasy years of settlement. This is high drama indeed.